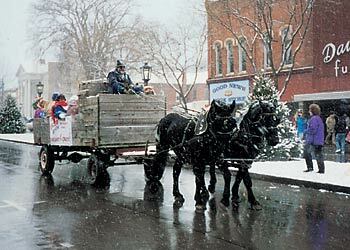 Wellsboro is a great place to visit year-round. 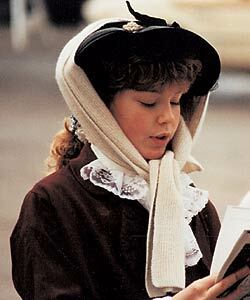 But it's extra-special during our “Dickens of a Christmas” celebration when we all step back into the 1800s. The town closes off three blocks of Main Street, which already looks old-fashioned with its gaslight-lined boulevard. Then craft and food vendors line the street. You'll see all sorts of handmade crafts, including ornaments and other holiday items. Bucky Green's beautiful hand-carved Christmas trees are always popular–he usually sells out before noon! You also can sample tarts, handmade chocolates, hot cider, gingerbread cookies, fresh-roasted peanuts and hot apple dumplings made by folks from a nearby church. Each year, they make about 3,000 dumplings and sell every one. Many people don period clothes, too. You'll see a town crier… a children's choir dressed like Dickensian orphans… and strolling musicians and dancers. 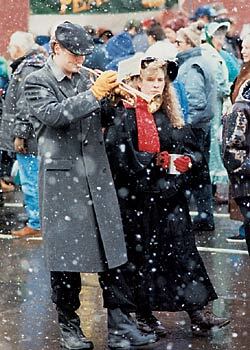 At 5 p.m., we take a candlelight stroll to “The Green” (the town square), where a Christmas tree-lighting ceremony starts at 5:30. It's even better if there's a snowfall–it's like something out of It's a Wonderful Life. If you walk downtown when the gaslights are lit, you half expect Jimmy Stewart to run by yelling, “Merry Christmas, movie house” (we have one), or “Merry Christmas, you wonderful old building and loan” (we have one of those, too). There are many other things to see here. Some of the state's oldest churches and buildings are in Wellsboro, which is almost 200 years old. Pamphlets that outline a self-guided walking tour are available from many merchants. The tour includes the West End Market, the town's oldest continuously operating store, established in 1902. And no visit would be complete without visiting the Wellsboro Diner, a 1930s-style eatery. The banter between the short-order cooks and the customers is as good as the food! There's no end of things to do. And no, I don't work at the Chamber of Commerce — I just love this town! If You Visit… Wellsboro is in north-central Pennsylvania at the junction of U.S. Highway 6 and State Highway 287, about 50 miles north of Williamsport. For information, call 1-570-724-1926. Nearby Leonard Harrison State Park features the “Grand Canyon of Pennsylvania”. Call 1-570-724-3061. The Little League Museum is in Williamsport; for details, call 1-570-326-3607. Corning, New York, famous for its glassmaking industry, is about 45 miles northeast. Its home to the Corning Museum of Glass and the Rockwell Museum, known for its collection of Western art. For details, call the Corning Information Center at 1-607-962-8997. I order some for Christmas 2016? I join the ranks of the people who bought many Bucky Trees from the Eldred Wheeler shop in Houston, TX which closed many years ago. For those of us who live too far away to travel to PA, is there some way to buy them online from him or a website to contact him through to buy more of his trees? Where can I buy Bucky Green Trees ? I also purchased Bucky Green trees in Houston and would like to obtain another one. I appreciate any help you can give me concerning this matter. I have bought a number of Bucky Green Christmas trees throught the years, 'tho the shop I bought them from in Houston has closed. Please let me know where I can contact him - or a place I may be able to find more of his trees.